The founder of Kyokushin karate, Masutatsu Oyama, was born in 1923 near Seoul in South Korea. He studied Chinese kempo at 9 years of age. When he was 12, he went to Japan to live and enrolled at university. After mastering judo, he became a pupil of Gichin Funakoshi himself making such rapid progress that at 17 he was 2nd dan and at 24 became 4th dan. Deciding that he wanted to devote the rest of his life to spreading the knowledge of karate, he spent the next year in seclusion from human society, living in temples and in the mountains; subjecting himself to the physical rigours of martial arts training day and night and meditating on zen precepts, seeking enlightenment. In 1951 he returned to civilisation and started his own training hall in Tokyo. Karate is both an art and philosophy, because each person has a different personality, this reflects in their interpretation. Therefore, karate masters founded their own schools, teaching their style or ryu. “Kyokushin” is the name given to our style. It takes time to fully understand the meaning. 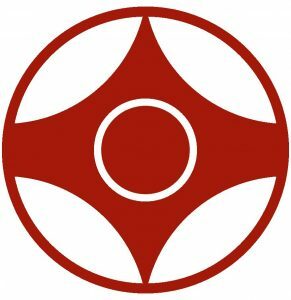 The symbol of Kyokushinkai is the Kanku. The Kanku is derived from the Kanku kata, “sky gazing” form. In this kata the hands are raised to scan the sky and the symbol is formed. The points of the Kanku represent the fingers and imply the ultimate’s or peaks. The thick sections, represent the wrists and imply power. The centre represents infinity, implying depth. The whole Kanku is based on and enclosed by a circle, representing continuity and circular action.